How to download 1080p iTunes M4V movie to Android Phones/Tablets? iTunes is a great media library which provides you with all kinds of music, TV shows, movies and Apps for downloading. Some of contents like movies and TV shows need to be paid before you can enjoy them. However, the contents you purchased from iTunes are only allowed to be played in iTunes or transferred among Apple devices. Though Apple claims that this would better protect the copyright of the media producer, it seems unacceptable by people who have Android devices instead of Apple’s. So how can we download 1080p iTunes M4V movie to Android phones/tablets? First we need remove the DRM protection from those 1080p M4V movies downloaded from iTunes Store. And then we need convert 1080p iTunes M4V movie to Android phones/tablets since the Android devices do not support .m4v file for playing. This article mainly tells you the easiest way to put 1080p iTunes M4V movie to Android devices with NoteBurner M4V Converter for Windows. NoteBurner M4V Converter Plus for Windows is a top DRM M4V video converter for Windows users to remove DRM from iTunes purchased videos and convert iTunes M4V movies to Android devices like Samsung Galaxy S3, Galaxy Note 10.1, Google Nexus 7, Amazon Kindle Fire HD, etc. Below is a quick guide for you to convert iTunes M4V to Android device for enjoying on Windows XP/Vista/7. Preparation: Download NoteBurner 1080p iTunes M4V to Android converter. And please check if you are running the latest version of iTunes. Step 1. Add M4V resources to NoteBurner M4V Converter Plus. 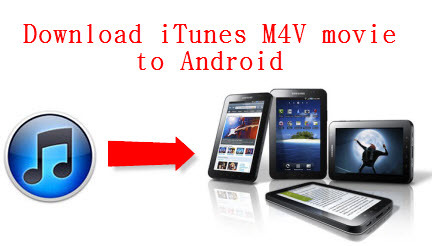 Launch the DRM M4V to Android converter and iTunes will automatically run together with the program. Click add button and then choose M4V movies for input from iTunes library. Step 2. Choose output settings for Android devices. To convert 1080p iTunes M4V movie for Android devices playing, you need choose Android compatible video formats like MP4, MOV, AVI, and etc. Here we recommend you click format menu and choose same as the source video (*.mp4) to keep the 1080p video quality in the output videos. But is your device doesn’t support play 1080p videos, you can change the video size from the blank on the right side of the interface. Step 3. Begin 1080p iTunes M4V to Android conversion. Just click the convert button and start to convert iTunes M4V to Android phone/tablet. Leave the program and iTunes converting the movie. This DRM M4V to Android video converter wouldn’t take much time to finish the conversion process. After that, you can connect your Android devices to the computer and finally succeed in downloading 1080p iTunes M4V movie to Android phones/tablets.